[FHD video and podcast below] Exclusive FHD video interview with Mr. Edward Goh, Hong Kong Disneyland's Vice President - Commercial Strategy. 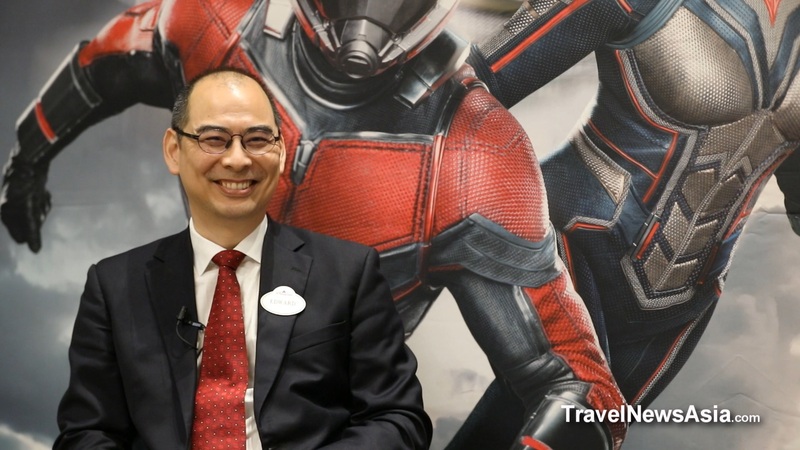 In this interview, filmed at Hong Kong Disneyland Hotel on 12 April 2019, Steven Howard of TravelNewsAsia.com asks Mr. Goh about their recently released annual figures. We discuss the increase in visitors to the park, which three markets enjoyed double digit growth in 2018, and Mr. Goh explains why he feels that those markets in particular are doing so well. We discuss the importance of the new attraction, Marvel's Ant-Man and The Wasp Nano Battle, who Mr. Goh feels that it will appeal to the most, and what impact it will have on Hong Kong Disneyland's 2019 targets. We also talk about the hotels, how the first full year of operations for the Explorer's Lodge has been, what Nemo will be doing there soon, and how guests between the three hotels differ. Mr. Goh tells us what is happening to the Castle, when it will re-open and what guests can expect from the first Disneyland in the world to reinvent this famous landmark. We also discuss sport tourism and the annual 10K run that Hong Kong Disneyland organises, Steven asks why there are not more runs or sporting events at the resort, and we talk about the importance of concerts and who visitors can expect to see in coming months. All that and much, much more in the FHD video and podcast interview below. See latest HD Video Interviews, Podcasts and other news regarding: Disneyland, MICE, Sport Tourism, Hong Kong.